During the development of the esw GROUP towards a supplier of complete system solutions, the stamping technology was developed as a further competence field in addition to the cold forming. We meet the requirements of developing cost-effective production methods with optimised material usage. The used compound tool sets or rotating cycle tools are designed and built in our own house. With this, we consequently rely on modular design to offer fast set-up processes and exchangeability of the components. 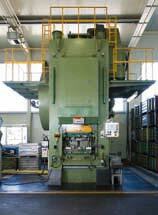 We use hydraulic and mechanic presses with press forces of max. 1,000 t where we can machine metal sheets of 8 mm thickness.